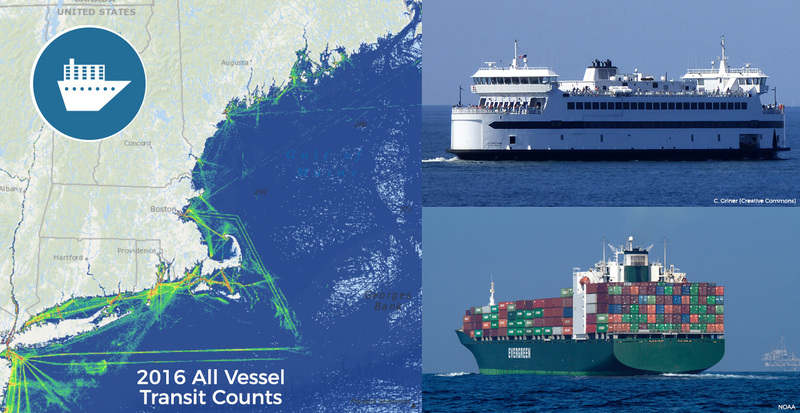 The Northeast Ocean Data Portal announces the release of updated data on vessel traffic in U.S. waters from New England through the mid-Atlantic region. This update includes data from 2015 and 2016, adding to the 2011, 2012, and 2013 data previously available on the Portal. The vessel traffic datasets and interactive maps were developed in collaboration with partners from maritime industry, the U.S. Coast Guard, the Marine Cadastre, and the Mid-Atlantic Regional Council on the Ocean. The maritime industry contributed valuable input at numerous presentations and briefings throughout the Northeast region, helping to guide how the data should be processed and presented to maximize their accuracy and usefulness. The data products underwent extensive expert review and were revised several times based on the reviews. A new data-processing methodology was developed to create maps that show actual vessel transits, rather than relative density of vessel traffic. New categories have been added for fishing vessels, pleasure craft-sailing vessels, and other vessels that do not fit within these new categories, or within the existing categories ofcargo vessels, passenger vessels, tug-tow vessels, and tanker vessels. In addition to the annual data, monthly data are now available for some years and vessel categories. A time slider allows website users to easily visualize changes in activity by month through the year. The time slider is currently available on the Maritime Transportation theme map and will be added soon to the Data Explorer. The Portal’s vessel traffic datasets and maps are based on data from Automatic Identification Systems (AIS), navigation safety devices that transmit the locations and characteristics of many types of vessels. The new data can be viewed on the Marine Transportation theme map or on the Data Explorer map, which provides the option to add other types of data to the map. Data download packages are available for both the monthly and annual data on the Data Download page under the Marine Transportation heading. Vessel traffic data for 2017 are currently being processed and will be released soon.